photo caption: Kelly Walsh's David Schmitt comes up for air during the 200-meter individual medley during Friday's Fish Bowl at the KWHS Pool. 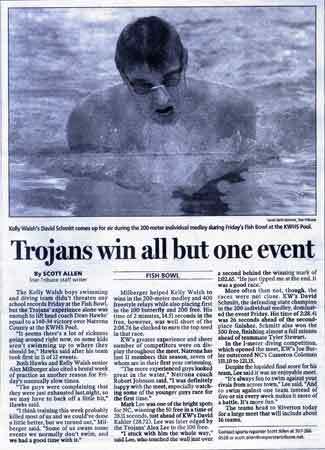 The Kelly Walsh boys swimming and diving team didn't threaten any school records Friday at the Fish Bowl, but the Trojans' experience alone was enough to lift head coach Dean Hawks' squad to a 140-34 victory over Natrona County at the KWHS Pool . . .
More often than not the races were not close. KW's David Schmitt, the defending state champion in the 200 individual medley, dominated the event Friday. His time of 2:28:41 was 26 seconds ahead of the second-place finisher. Schmitt also won the 500 free, finishing almost a full minute ahead of teammate Tyler Stewart. Casper Star Tribune (Casper Wyoming), December 2005, Staff writer, Scott Allen. Note: David Charles Schmitt is the son of Chuck and Susan Hutchison Schmitt.